One of my absolute favorite things about summer is all of the fresh berries. Strawberries, raspberries, blackberries, blueberries…I really think I could almost live on berries alone during this time of the year! When my wife and I moved into this house a couple years ago, we planted a bunch of berry plants. They took a couple of years to get established, but now they are finally getting big enough to produce a decent amount of fruit. I’m very excited about this! (That is, if I can keep the chipmunks away…those little buggers are quite determined. My strawberries are planted in a raised bed which at this point looks something like Fort Knox.) While I often eat summer berries right out of the garden, I love including them in recipes, too. 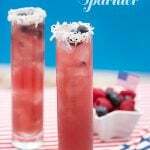 One of my favorites is this Red, White, & Berry Tart. It includes a sweetened mascarpone base, and it’s topped with fresh summer berries. Not only is this a pretty simple dessert to make, it is colorful and it also really highlights the natural flavor of the berries. 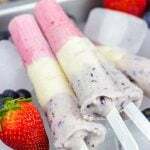 It’s definitely a favorite summer treat in our house! 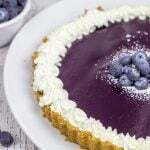 I prefer to use mascarpone cheese as the primary ingredient in the base of this tart. Mascarpone cheese is Italian in origin, and it is somewhat similar to cream cheese. However, mascarpone cheese is much easier to spread, which makes it ideal for filling a tart. I do also lighten the texture of the mascarpone by folding in a small amount of freshly whipped cream. The pie crust in this recipe tends to be rather flaky, but the tart is still easily filled thanks to the light texture of the mascarpone. Since the mascarpone mixture is not baked, this is an extremely easy dessert to pull together on short notice (especially if you use store-bought pie dough instead of the homemade version). Soon enough it’ll be winter and we’ll be talking root veggies and stews (which isn’t necessarily bad), so get out and enjoy the fresh summer berries while they are in season! Using a pastry blender or two forks, cut in butter until mixture forms small pea-sized balls. Slowly add water and toss mixture lightly with a fork until dough forms a single ball and pulls away from edge of bowl. If needed, add more water in very small increments until no dry ingredients left in bowl. Flour table well and roll out dough until approximately 1/8 inch thick. Use caution at this step to ensure that dough does not stick to rolling pin or table. (Dust pin and table if dough begins to stick.) The dimensions of the dough should correspond to the size tart pan you are using. Roll finished dough onto floured pin and unroll into tart pan. Cut off any excess dough and push dough into the crimped edges of the pan. Use a fork to dock the dough at regular intervals. Scatter pie weights (or dry beans) around the tart to keep it from developing air bubbles while baking. Bake at 425 for 20-24 minutes, or until lightly golden brown. In a small bowl, whip the heavy cream until soft peaks begin to form. Set aside. In a medium bowl, stir the mascarpone until loose. Add the lemon zest, confectioner's sugar, vanilla, and brown sugar. Stir until well combined. Carefully place the baked shell on a large plate. Using an offset spatula, fill the shell with the mascarpone mixture. 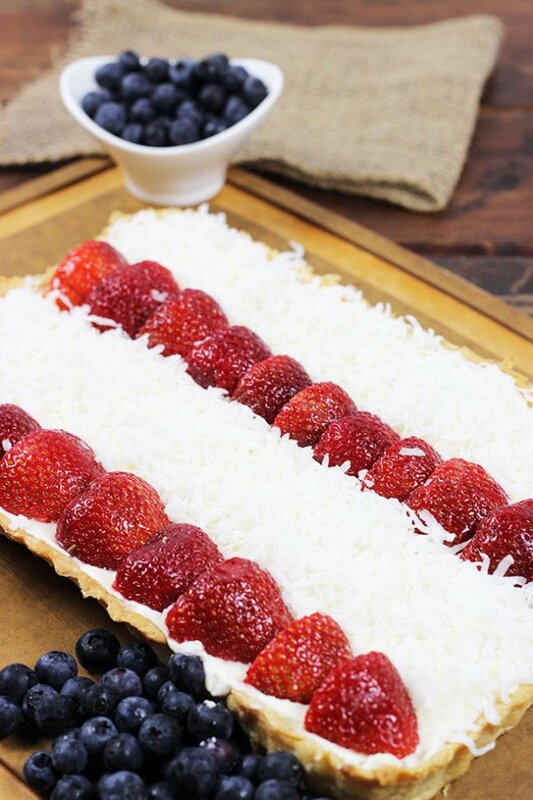 Layer the sliced strawberries and shredded coconut in alternating rows (or any other design you choose). Scatter blueberries around the edge of the tart. Chill for 1 hour prior to serving. Serve cold. This tart looks delicious! I’ve been in a serious berry-eating mood this summer, too. We’re not lucky enough to grow our own, but our fridge is always stuffed with cartons and cartons of fresh berries. I love that they’re sweet enough to be dessert on their own, but are also so good in other desserts! Thanks for the comment, Elizabeth! 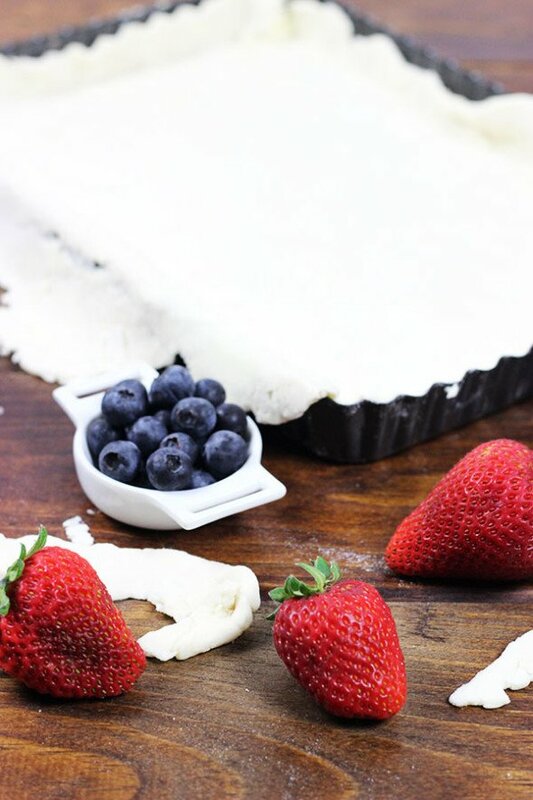 This tart is one of my favorite summer desserts…mainly because it is really easy to make and it highlights the taste of the fresh berries. Happy tart making!! 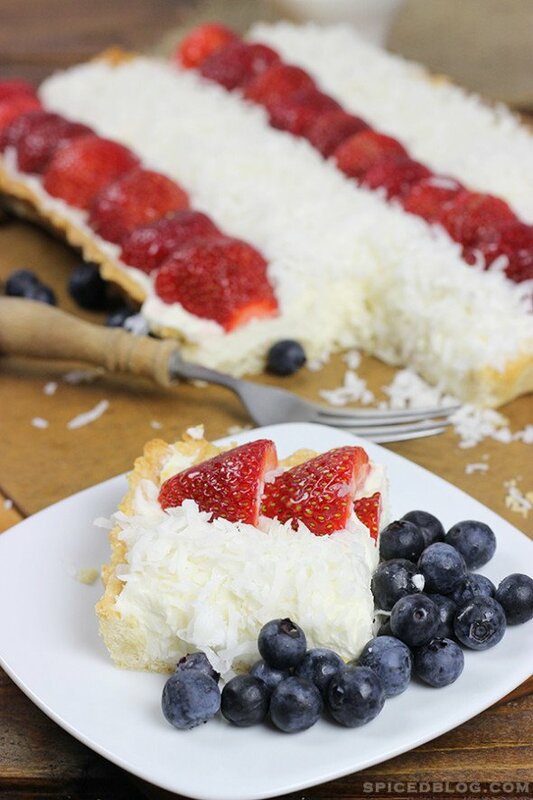 Beautiful tart, I love coconut!